Unfortunately, every nonprofit deals with lapsed donors, or donors who used to contribute to your organization but have since stopped for whatever reason. While every organization and donor management software provider has a different definition for what makes a lapsed donor, you can play by a general rule of thumb: these supporters haven’t given in over 12 months. While you may be excelling at donor retention, donor acquisition, and general stewardship, there are some supporters who fall through the cracks. You should make sure you’re doing a thorough job when it comes to donor acquisition, but regaining lapsed donors is still a crucial element to your overall success. These supporters have confirmed their interest in your organization and have previously donated to help further your cause, so they’re worth reconnecting with! If you’re ready to rebuild your donor base by turning your lapsed donors into active donors again, let’s begin! 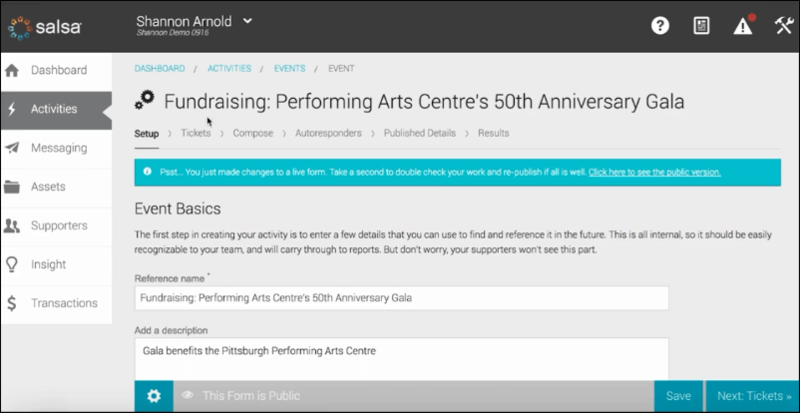 Use your fundraising software in conjunction with your CRM to determine your lapsed donors. Every organization has a different definition, but we categorize a donor as lapsed if he hasn't given or interacted with a nonprofit in over a year. These donors are often labelled as those who "gave one year but didn't give the next." 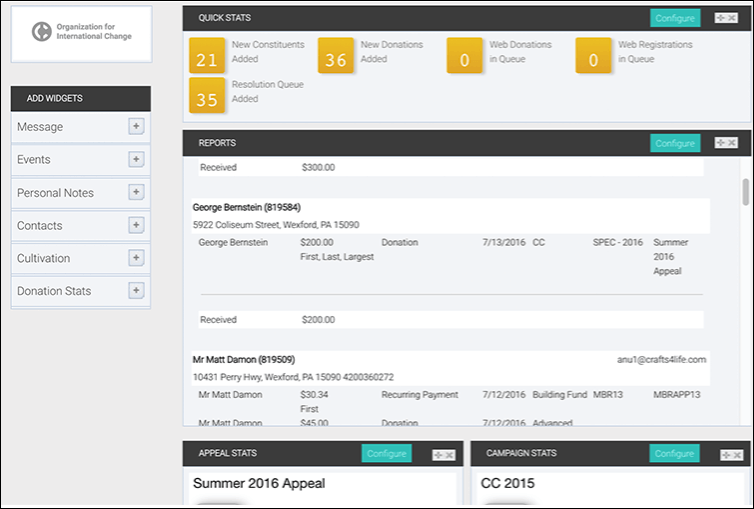 Luckily, Salsa's CRM can help organizations create reports that match their definition of a lapsed donor (or ours!) to help identify those who need to be reached out to. 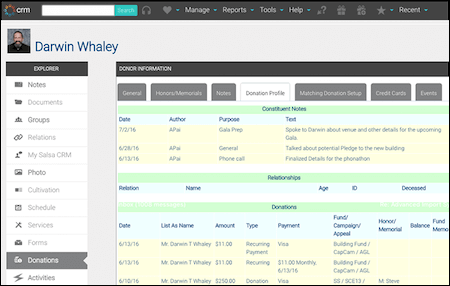 Salsa's CRM helps determine from donor profiles which methods your organization should use to communicate with your lapsed donors to support multiple goals. No donor is the same, which means no lapsed donor stopped giving for the same reason as another. Your donors will be able to tell when you send out mass emails and mass letters because they’ll be missing one thing: personalization. Sending a blanket approach will do more harm than good. When reaching out to lapsed donors, you want them to understand how much you value their support, so you’ll want to personalize the content in your appeal. Use their names, reference past projects they gave to, tailor your fundraising strategy and donation ask to their average giving amount—we’ll cover all this in later sections. Since you’ll be writing such tailored approaches, keep in mind it’s probably not worth reaching out to donors who only gave $10 at maximum. You’ll want to select quality lapsed donors to focus on in efforts to maximize your potential profit. Just remember that an authentic letter could mean the difference between reconnection with or isolation from your nonprofit. Your letters and emails should communicate how much you miss your supporters! It’s imperative that your approach comes off as such. You don’t want them thinking you only miss their money because no one wants to feel like an ATM! We miss having you as part of our nonprofit family! We’ve missed hearing from you. We haven’t heard from you since September of 2015. We’re counting on your support again for XYZ campaign. We miss your moral support. Find a way that voices your concern for their well-being and thanks them. Remind them when you last heard from them or the last time they were involved with your organization—they may have simply forgotten to donate! Making them feel like they were part of something authentic and positive is a surefire way to win back lapsed donors. 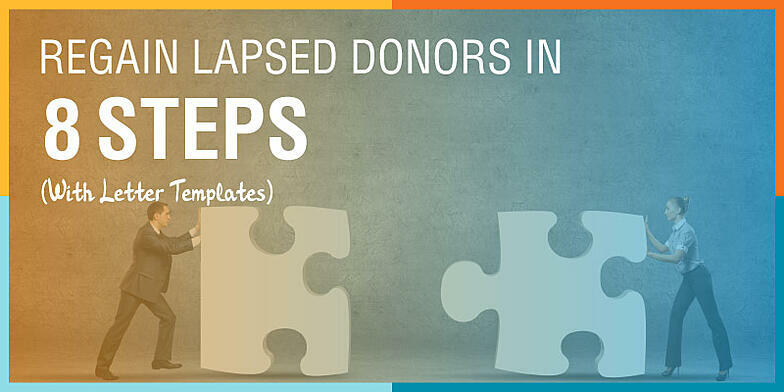 Provide your lapsed donors with an easy road to reconnection with your nonprofit by giving them actionable next steps. If they previously volunteered at your fun run a few years back, invite them to volunteer again! Perhaps you have an upcoming 5K run or marathon event that they would be interested in helping out with. On the other hand, if a donor never volunteered but expressed interest in doing so, you might offer the option of participating in your peer-to-peer campaign! This way your lapsed donor can simply use their network and restart their involvement with your organization easily. Pay attention to the methods of involvement you provide. Simply because a donor volunteered for a fun run doesn’t necessarily mean they’d want to help at your gala. Try to tailor the opportunities you have to each donor’s interests and preferences. One convenient way to get your lapsed supporters involved with your cause again is to make the most of your online advocacy software. Using these tools, your team can craft compelling advocacy campaigns to draw supporters in. It might be more convenient for a lapsed donor to, for example, sign a petition rather than volunteer at an in-person event. Alternatively, they might not be inspired enough to launch a peer-to-peer fundraising campaign on your behalf, but they may be interested in contacting their legislator via social media. The bottom line? Give your constituents a diverse range of opportunities for reengagement. This way, you won't lose out on lapsed supporters by failing to offer them the opportunities that excite them the most. As mentioned earlier, the more you can personalize your outreach, the better, so if you know any specific metrics about the engagement your organization and any donors have, that’s perfect information to include. The last time you gave to our organization, you helped us build shelters for those affected by the hurricane. We’re hoping you can help us do the same for those affected by the latest earthquake in Mexico City. We appreciated when you contributed to our “No Child Left Behind” campaign. Your efforts helped us provide children in need with backpacks, books, and other school supplies. We’re writing to you today because we believe you can help us raise money to offer English classes to children in developing nations. With your previous recurring donations, you saved 31 abandoned animals. From your donations alone, we were able to supply animals in need with kennels, beds, food, and more. But there are still animals who need our help, which is why we’re writing to you today. Use their past experiences with your organization and overall interests to show just how much you know your donors. This will stress just how much you notice the difference when you don’t have their support. In other words, this will help emphasize how much you miss them, yet again. Segment your lists by the length of time a donor has been lapsed in supporting your organization. You could organize your outreach methods by 1, 2, 3 years lapsed, or by 12-17 months, 18-24 months, 24-36 months and so on. Different donors should receive different messages, so it makes sense to categorize them by the date of their last engagement. More recently lapsed donors might receive more casual, laid back approaches while donors who haven’t given in a few years might receive more aggressive appeals. 1 year: The gift you provided last year impacted more people in need than we expected! We think your gift this year can help our nonprofit make an even bigger difference. 2 years: Your support aided our nonprofit in so many ways. We’d love to see your help continue to flourish with our next campaign for XYZ. 2+ years: Your previous support has had a powerful impact on those in need. We haven’t heard from you lately, but we think you can help our organization provide XYZ. Pick segmentations that make the most sense for your nonprofit and your lapsed donors and be sure to choose language that is warm, welcoming, and progresses appropriately for varying donors. 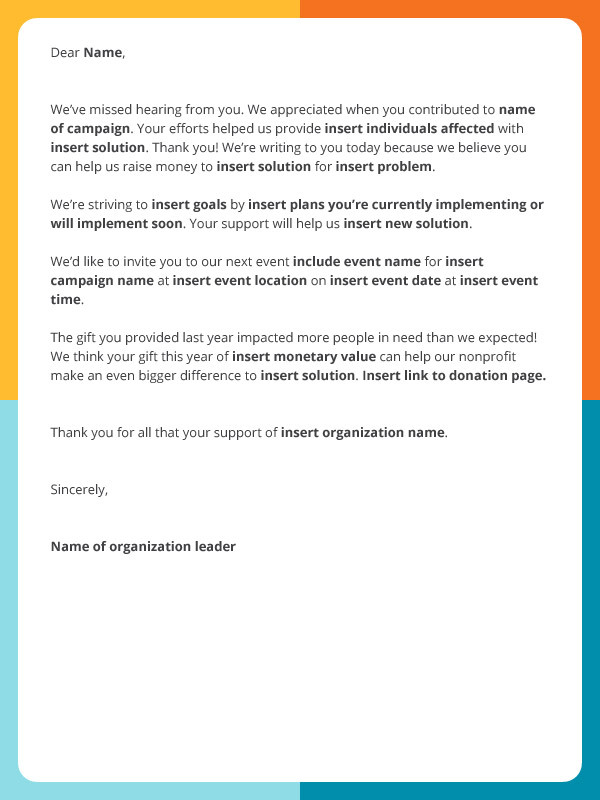 This is a huge step toward showing your lapsed donors you really care about them. If your expertly crafted and tailored message reaches your lapsed donor through their preferred method, you’ll increase the likelihood of winning them over. You’ll likely split your donors into two groups: those who prefer email, like younger donors, and those who prefer letters, who may be older donors. 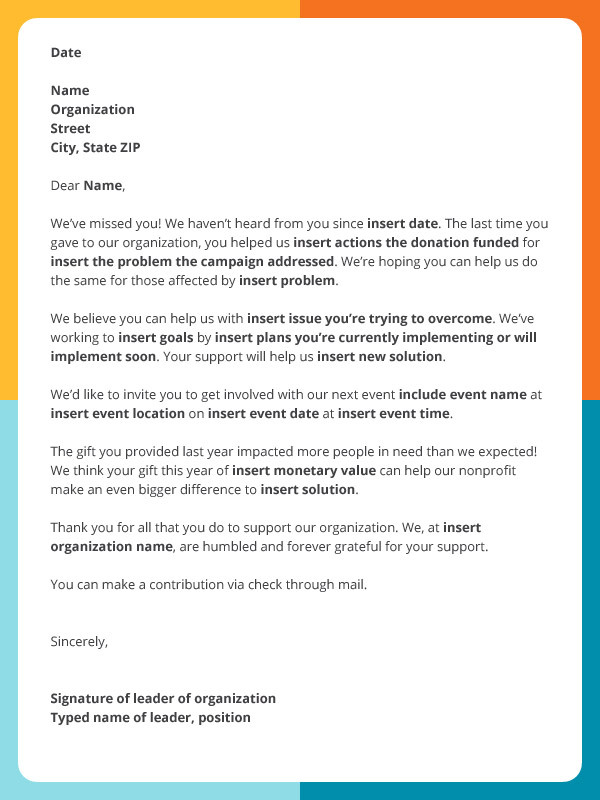 Take a look at these templates to craft the perfect approach for email and letter appeals! As you can see, these two messages are fairly similar! The main difference is the action of donating. While those who prefer mailed letters would most likely prefer to mail in a check, those who prefer emails will probably prefer to be redirected to your online donation page. Remember that delivering your message through your donor’s favorite form of communication will prove to them that you really know and value their preferences. Once you’ve mastered writing the flattering part of your appeal, all that’s left to do is ask for a donation. Again, no donor is the same, so they’ll each require a customized ask. Some of your lapsed donors will have given monthly for significant amounts of time while others will have given here and there. The more supportive a donor has been, the more personal an appeal they should receive. If a donor only gave at most $150 twice a year, your appeal should ask for a lower donation than, for example, the appeal for a recurring donor who gave $300 every month. You can ask lapsed donors for contributions that are the same as their average donations or the same as their smallest donations. That decision will be up to you, so whatever amount you decide to ask for, just make sure it’s plausible and asked for with grace and gratitude. Now that you have our easy 7-step process for regaining lapsed donors, you’re sure to have an ever-expanding donor database. Keep in mind every donor is different and deserves a personalized approach delivered in their preferred method of communication. Good luck stewarding your lapsed donors!